No bidding war on Klondike? About a week after the end of the Tropicana crazy bidding war, the Klondike hotel casino is sold to Royal Palm Communities out of Boca Florida for around $48 million. Since the property was owned by one person, not a corporation, there might have been a bidding war and we just don't know it. The Klondike is the first hotel after the Welcome to Las Vegas Sign and is scheduled to be shut down on June 30. Get in a taxi in NY. They take you where you want to go, no questions ask. Take a taxi in Vegas and the driver refuses to drive you to a place because it is not overally profitably for him to take you there. He would rather wait for the next ride. We need to stand up for oursevles. If a taxi driver says he won't drive you somewhere and you are already in the cab, refuse to get out. Taxi drivers are the worst part of vegas, walk if you can. Year after year, we hear that downtown Vegas is going to the place to be. The �Revitalization of Downtown Vegas� is a term often used. There have been a number of new restaurants and stores, but it still has not taken off. It is missing big money. A big time developer to come in and redo the entire area, not just a couple of new shops here or there. It needs it equivalent to Project City Center or Echelon Place. David Mitchell and Barnet Lieberman might be the men to do it. With a quiet land purchase of 14 acres, a big project on this land could really kick start the development of the area. I see big things happening. If they can do the Beatles (the new show LOVE opens soon at the Mirage), then I guess they can do an Elvis Cirque du Soleil. I just don�t want the Cirque performances to become �normal�. As amazing as they are, if every show has acrobats that can perform unheard of human feats, then it just won�t be that special anymore. Wayne Newton to leave Flamingo. Where will he end up? The Flamingo signs Toni Braxton to a 2 year contract. That means Mr. Las Vegas is out of the Flamingo Showroom. Where will he end up? 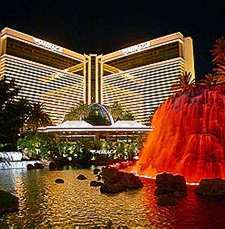 Possibly stay in the Harrah's familiy and go to the Rio? Take over the spot that the Scintas left vacant? Tropicana Deal is Done. Finally. Aztar agrees to Columbia Sussex's last bid. My favorite part is that Pinnacle was paid $78 million for termination expenses. Columbia Sussex raises bid for Tropicana by $1 per share. Is this over yet? Now Columbia Sussex is bidding against itself. I think the deal is finally done. Next up...the Sahara. No Center Bar at Mirage? You know how much I preach about the use of a center bar in a Vegas Resort. It�s the place you tell people to meet up with you, it�s a meeting place when you are going out as a group, it�s a place to grab a quick cocktail after check-in, and it�s a place you can go to step away from the casino action and breathe. It�s also a place where the non-gamblers can have a good time while their friends are still working the tables. And, most importantly, it is a place where women tend to end up when they can�t find any other viable options. It is easier to meet a girl at a bar than walking around the casino floor. The new renovations at the Mirage took out the Baccarat Bar and lounge. The area is now a high limit slot room. The renovations are not done yet, but hopefully a new center bar is in the works. The center bar was a big gathering point for the �working girls� at the Mirage. I walked around the resort at midnight on the lookout. So where are they? I found them at the new bar for the Kokomo�s restaurant. They moved the bar to the opposite side of the restaurant, right near the front lobby. There were about six of them, all lined up on the bar sipping on hot tea. Is the Tropicana Bidding War Over Yet? Back and forth. Bid and rebid. Colombia just trumped Pinnacle again with another bid. Now, investors are trying to get Pinnacle to bow out and not rebid. There have been 15 bids for Aztar Gaming, the owner of the Tropicana Brand Casinos. As we also see with the recent purchase of the Hard Rock at a over stated price, companies are desperately trying to get into the Vegas market. Sahara, Riveria, New Frontier, even the little know Klondike Casino all have interesting futures ahead of them as the owners contemplate development or just selling out. At these prices, I expect many of them to take the money and run. Are the Entourage stars fans of the Little Black Book? Get in a taxi in NY. They take you where you want to go, no questions ask. Columbia Sussex pulls ahead..... these guys are very aggresive.